Part submarine, part aircraft, Rutgers University researchers have developed a drone that is just as at home underwater as it is flying through the air. Watch the video to see the "Naviator" drone in action! We’ve mapped the surface of the Earth in excruciating detail, with images of individual streets and rivers and canyons photographed and catalogued. But one area of the Earth remains a mystery: the ocean floor. Ninety-five percent of the ocean hasn’t been mapped in any kind of detail. The maps of the world’s seafloor that you see online are mostly approximations based on scattered bits of data collected by expeditions over the years. “What we see on Google Ocean is really about a five kilometers [16400 feet] resolution,” says Jyotika Virmani, head of the Ocean Discovery XPrize. 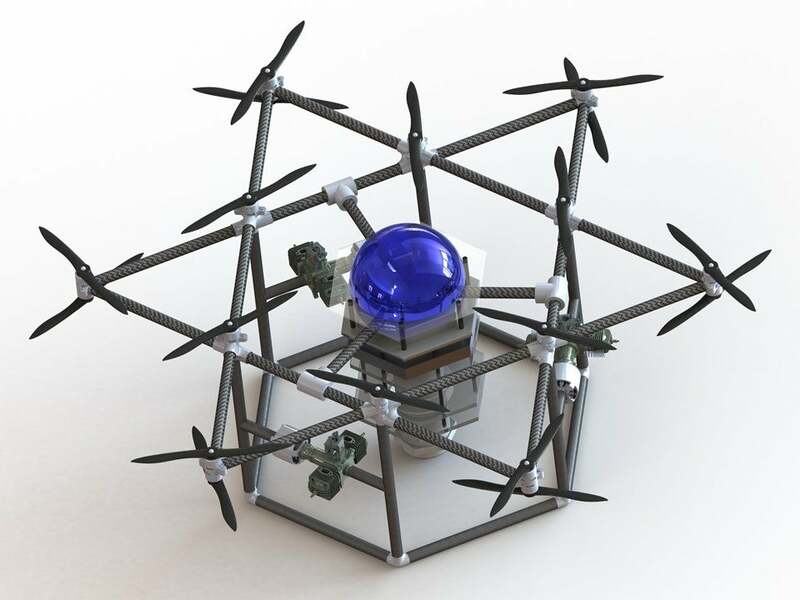 Team Arggonauts from Germany has proposed a swarm of 12 deep-sea robot drones. On Thursday, Virmani announced the 21 semifinalist teams who will advance to the next round of the Shell Ocean Discovery XPrize competition, and who will hopefully help make the seafloor less of a mystery. They will compete to build new technology to map the seafloor down to a resolution of just five meters (16 feet). The teams are comprised of researchers from all over the world, a mix of both students and professional engineers and oceanographers. To compete, they must design a system that is able to operate more swiftly than any existing mapping technology in extreme temperature and pressure conditions that are very different from what we experience on land. “This is a chance to develop a technology to explore a new planet,” Virmani says. The researchers are given a good amount of leeway to approach the mapping problem. During the upcoming round of competition they will have to map at least 100 square kilometers in a 500 kilometer test area, take a photograph of a specified object on the seafloor, and identify and take photo or videos of five other objects of geological, biological, or archaeological importance. They’ll have 16 hours to gather the data and 48 hours to process it. The test site won't be announced until later this summer, but we know teams will be competing in the fall, and that the test site will be located in waters about 2,000 meters deep. Conceptual image of Blue Devil Ocean Engineering’s heavy UAV. The teams are taking a wide variety of approaches. Many are using swarms of underwater drones to cover a larger swath of the test site. At least one team, Eauligo, from France, plans to use drones that will mimic bee behavior beneath the sea. Others are using drones to drop Automated Underwater Vehicles (AUVs) near the test site, and still others, like New Jersey-based team SubUAS, are using drones that can fly as well underwater as they do above it. They will be scored on how well and how quickly they can complete the tasks set in front of them. Of the 21 teams in the first round of semifinals, up to 10 will be selected to move on to round two. Those 10 (or fewer) teams will split a benchmark prize of $1 million and will have time to perfect their machine before sending it once again into the deep. Only this time, they will be required to operate in 4000 meters of water—the average depth of the sea floor. $1 million will go to the second prize winner, and $4 million will go to the first prize winner. An additional $1 million will go to the team that competes an additional competition sponsored by NOAA, which asks teams to develop a tech that can track a chemical signal through the open ocean. All the money is a bonus, but Virmani and others hope that these inventions might help expand the world of ocean exploration, and help us preserve the ocean that we have. “In order to make something healthy you need to value it but to value it you need to understand it,” Virmani says. Arggonauts (Karlsruhe, Germany) – Led by Gunnar Brink, the team is creating a swarm of 12 intelligent deep-sea robot drones using insight gained through two previous projects. BangaloreRobotics (Bangalore, India) – Led by Venkatesh Gurappa, the International team is developing innovative and low-cost Underwater Swarm AUVs. Blue Devil Ocean Engineering - Duke University (Durham, NC, United States) – Led by Martin Brooke, the Duke University team is working with heavy lift aerial drones that drop retrievable diving SONAR pods. CFIS (Arnex-sur-Nyon, Switzerland) – Led by Toby Jackson, the team is designing a swarm of underwater robots that use lasers for ocean floor mapping as well as imaging of interesting creatures and formations. Eauligo (Nice, France) – Led by Christopher Lewis, the team is developing miniature micro subs that mimic bees and their behavior to map and explore the deep ocean. Environdrone (Windsor, Ontario, Canada) – Led by Ryan Cant, the team is using aerial drones that launch next-gen AUVs. Exocetus (Wallingford, CT, United States) – Led by Joe Turner, the team employs several low-cost underwater gliders equipped with side-scanning sonar to map for extended periods of time. Gebco-NF (New Zealand, Global) – Led by GEBCO-Nippon Foundation scholars, the 12 nation team is integrating existing technologies with a new unmanned surface vessel to contribute to comprehensive mapping of the entire ocean floor by 2030. Pisces (Portugal) – Led by Nuno Cruz, the team is aggregating Portuguese technologies developed at INESC TEC (Porto) and CINTAL (Algarve) to create the PISCES system that leverages cooperative robotics. Kuroshio (Yokosuka, Japan) – Led by Takeshi Nakatani, the team is integrating technologies owned by Japanese universities, institutes and companies for a unique collaborative approach centered around AUVs. Lehigh Tide (Bethlehem, PA, United States) – Led by Matthew Ciolino - The Lehigh University team is creating a cost-effective autonomous underwater vehicle that can accurately scan the ocean. Ocean Quest (San Jose, CA, United States) – Led by Danny Kim, the team endeavors to design a marine STEM platform for students worldwide to enable project-based learning with new technology and techniques. Oceanzus (Durham, NH, United States) – Led by James Case, the team is creating a continuous operating platform that supports multiple survey assets to realize the mapping goal. OD-Africa (Accra, Ghana) – Led by Mark Amo-Boateng, the team is building intelligent low-cost modular AUV/ROV systems to democratize ocean discovery, using advanced artificial intelligence and algorithms to navigate and explore the ocean. Orca Robotics (San Diego, CA, United States) – Led by Phillip Rhyner, the team is creating an underwater system that uses phase array radar and computing power to provide results in real time, which is a new use for this approach. SubUAS (Piscataway, NJ, United States) – Led by Rutgers professor Javier Diez, the team has created an AI-enabled drone that can fly quickly to remote survey locations, dive into the water and use a second set of propellers to navigate and intelligently explore underwater before flying home for data download, repowering and return flights. Tampa Deep-Sea X-plorers (Tampa, FL, United States) – Led by Edward Larson, the team is using existing technology and side scanning sonar on multiple AUVs to fully cover the large mapping area. Team Tao (Newcastle, United Kingdom) – Led by Dale Wakeham, the team is developing an autonomous swarm system for rapid surface to deep ocean exploration. Texas A&M University Ocean Engineering (College Station, TX, United States) – Led by Dylan Blakeslee and working in partnership with successful alumni of Texas A&M; the University team is using drone ships and AUVs equipped with innovative navigation systems, renewable power generation and chemical sensing technologies to explore remote ocean habitats. Virginia Deep-X -- Virginia Tech and Old Dominion University (Virginia, United States) – Led by Dan Stilwell, the team is developing small and low-cost underwater vehicles that operate in coordinated teams. X994 (Austin, TX, United States) – Led by David Ryan, the team is working to optimize robotic mapping of the ocean through advancements in software, AI, and data analytics.